Peripheral peeps into some world events and tumult in India is all I could have in the last forty days almost. Whole of December kept me busy with a fine international astrology course and then came, like an annual ritual, the cold wave, earlier than previous years. History moved, as it moves, but the television channels with their instant journalism obsession, made them look like big historic events. In India we witnessed Lokpal fiasco, in Pakistan the Memogate and possibly a noose thickening round the neck of President Zardari. A cyclone named Thane devastated Tamilnadu, the hundredth hundred eluded Sachin Tendulkar in cricket ( till I Jan), Djokovic dominated the tennis world like an unchallenged king, Putin faced agitations in Russia, Iran indulged in sabre rattling games, and USA has not declared its moves to counter it. But the narration must start with Pakistan, improving relations with India supposedly but defying USA almost like a super power. After the 18 Nov piece, two major events shook Pakistan. 1) The first was on 24 Nov NATO helicopters attacked a military checkpoint in north- west Pakistan, killing up to 25 troops and prompting Pakistan to shut the vital supply route for NATO troops fighting in Afghanistan, Pakistani officials said. The relations between Pakistan and USA deteriorated and US cut short its financial aid to Pakistan. 2) The second was the illness of President Zardari, his treatment in UAE, the rumor in Pakistan of his resigning, Gen Kayani and ISI chief Pasha forming, as reported, a front against civilian administration giving rise to the rumors or possibility to another, all too familiar, military coup. It is the dasha of Venus-Sun and pratyantara dasha changing is changing fast the contours and tensions of the civilian and army confrontation. All this has to be viewed against the changing priorities of USA. In the cold war era, it was Pakistan that was the darling of this super power and Pakistan was a member of SEATO, SEA DO etc. in the policy of the global encirclement of USSR. India leaning towards USSR from Nehru to Indira era inspite of the policy of dynamic neutrality was hated by Nixon and Kissinger. In the changed scenario, it is now China that is being encircled by USA and, Pakistan, describing China as its all-weather friend, is less favored but not alienated since USA has not yet dealt its final blow to the Talibanis and Al Qaeda. So the inevitable cold relation with USA forces Pakistan into a riddle wrapped in an enigma. The Pak-US strained relation is like the conjugal tension of a couple when the wife threatened that she would commit suicide and the husband said that he did not mind it but, it being the rainy, season wanted her to postpone it. Why asked the wife and the husband explained that frogs had developed a taste for human flesh and preferred women’s flesh more. The wife of course postponed the date of her suicide. But unlike earlier times when Pakistan’s military dictators were total American stooges, Gen. Kayani has showed courage to warn NATO and USA against using Pakistan territory in their attacks on the Taliban. Zardari, the American stooge, is too weak but is being accused of seeking American protection in the Memogate scandal to save him from an army coup after Osama bin Laden was killed and Pakistan’s deceit annoyed USA and amused and shocked rest of the world. 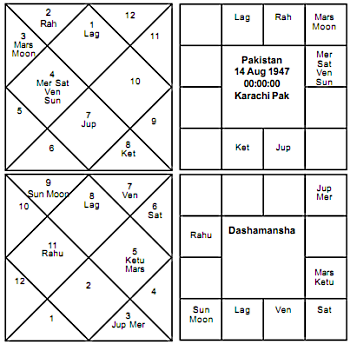 The transit Jupiter in Pakistan’s lagna and Saturn in the seventh house aspects the ninth house of judiciary. This is also the combination of the ninth and tenth lords in the seventh house clearly showing the present tensions in Pakistan The government, the army and the judiciary seem to be clashing with each other. The judiciary appearing to assert itself at the moment is showing a rare vitality of Pakistani democracy which had earlier been choked by Musharraf. Is it an illusion or reality considering the history of Pakistan and its unfailing military coups? These are the predictable uncertainties of the contemporary history of Pakistan. But Jupiter the ninth lord of judiciary aspecting both Mars and Moon in the third house aspecting the ninth house, shows the stellar role of the judiciary, a rare event in the history of Pakistan, unlike India where a powerful judiciary can shake our government. In the dashamansha, Jupiter in the eighth house aspecting the ninth lord Moon is a hope, however dim, of the judiciary prevailing and the army accepting its verdict after its decision to appoint a judicial commission to go into the Memogate. Given four weeks to do its work, the verdict of the commission will come out in four weeks or at the end of January and in the pratyantara dasha of Ketu with Mars in the tenth house of the dashamansha and aspecting the tenth house in the birth horoscope, may lead to a verdict favoring the army and upsetting president Zardari. The sensational article of October 11, 2011 Take on Pakistan's Jihadist Spies by Mansoor Ijaz, in the Financial Times gives enough material to the judicial commission against president Zardari. Two predictable uncertainties among many in Pakistan in 2012 is the end of the tenure of Zardari and the rise of Imran Khan and his PTI to rise as a third party at the cost of Nawaz Sharif and his party, since ISI seems to be supporting Imran. 1) President Zardari is ejected out of his present position rejecting his claim of immunity from judicial action so long as he holds his office. 3) Nawaz Sharif suffers shock defeats.